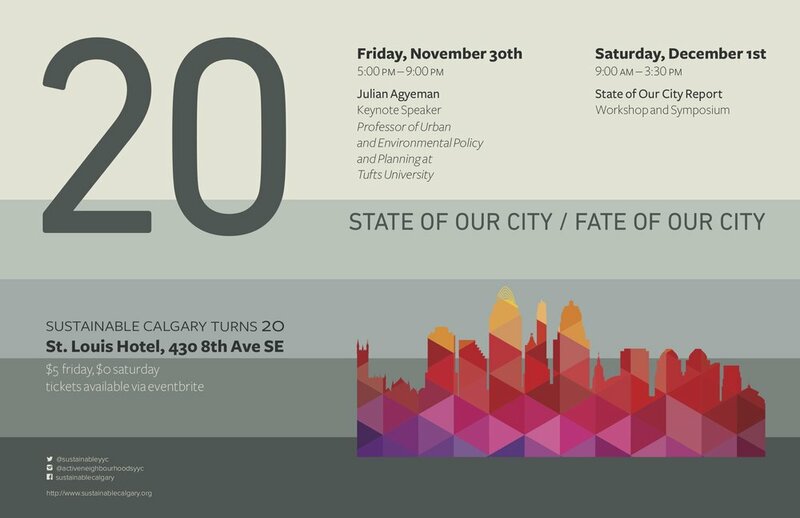 Sustainable Calgary celebrates its 20th anniversary, and we want to celebrate in the way we know best: conversation, knowledge sharing, and of course, great food! This two day event will celebrate our accomplishments and projects, evaluate Calgary’s sustainability, and ask the question: where do we go from here? We invite all Calgarians to join us. Tickets are a suggested donation of $10, but we encourage you to give what you are able. If it is less than $10, no problem, if it is more, great! We will also be offering charitable receipts for donations of $20 or more. Join us for a collaborative workshop where we will be looking at our updated State of Our City report and the 2005 Citizens Agenda. We would love your help discussing, interpreting and developing context around our latest set of indicators. And, building on the information we gather and the content of the 2005 Citizens Agenda, we want to discuss strategic policy priorities moving forward. Have the strategic priorities remained the same? Have they changed? How can our current programs move these strategic priorities forward? A delicious lunch and ample coffee will be provided.